Smokers have less money than non-smokers. How much less is equal to how much they spend on smoking. Managed to get into work this morning, even though the trains were disrupted due to the heavy snowfall overnight. Am now sitting in my office with my over-coat on as it is freezing due to the heating not working in the building. We've had several submissions this morning concerning a CoolTechZone article stating that Microsoft has purchased Opera, seemingly confirming the Dvorak article we reported on yesterday. However, roblimo has followed up with Opera and found that to be (so far), less than true. Opera PR person Berit Hanson told Slashdot by phone from Oslo, Norway, that "last week it was Google, this week it's Microsoft." She laughed and added, "If I was working for Microsoft I think I'd know it, but I'm still in Oslo, not Washington, still working for Opera." Which, of course, is not to say it won't happen ... it just hasn't happened yet. Had my result back this morning for TMA 02. Managed to get 65 out of 65. Really pleased. Now onto TMA 03. (Insider Report) - Here comes a surprise. In a recent conversation with one of our insiders at Microsoft, the source revealed that Microsoft Corp., the world’s largest software maker, has acquired Opera Software, makers of the Opera browser. The insider reported that both Microsoft and Google were trying to bid on Opera, but in the end, the software maker took the lead. TMA's 03 and 04 have been published on the M254 course website. TMA 03 has 4 questions, and covers units 4 and 5. TMA 04 has 5 questions and covers units 6 to 9. I have had a brief look through the TMA's and TMA 04 looks rather hairy. Still we have until the 18th May 2006 to submit it (TMA 03 has a cut-off date of 23rd Feb 2006). Dinosaurs could not possibly still exist on a tiny island, neither could King Kong. This picture story from the BBC has some interest facts concerning toy making within China. Most we spoke to seemed reasonably content with factory conditions. However, campaign group China Labor Watch found that “excessive work hours, dangerous equipment and chemicals, cramped employee dormitories, abusive managers, crooked hiring practices, and pay below even China’s minimum wage” of 690 yuan ($86; £49) per month were all too common in 11 other toy factories it studied. Margot Wallstrom, Vice-President of the European Commission, has made an interesting comment in her blog. 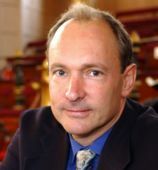 Thank you for your comments on Janez‘ post, please continue to comment on it. I will write about my trip to Germany next week but first I wanted to say something else. I hoped for snow during my trip to Berlin and then we got plenty of snow in Brussels last weekend. As usual, it caused chaos and anarchy on the streets. But that was, unfortunately, not all. I heard from a friend that two people froze to death in Brussels. One in front of a church (heated but locked) and one in front of a hospital. It seems like Microsoft is not alone in “bad company“. Google has agreed to exclude publications that the Chinese government finds objectionable. And Yahoo has even gone further. They collaborated with the Chinese government and gave up the name of a writer who sent an e-mail that commented on a party decision. Based on this information, the man received a ten-year prison sentence. According to the organisation Human Rights Watch these companies are hiding behind statements claiming that they “have to ensure that they operate within the laws, regulations and customs of the countries they are based in”. Words like ethics and corporate social responsibility seems to be deleted from their corporate code of conducts – or they have flexible ethical standards depending on where they operate… I can only recommend these companies to visit the website of the UN Global Compact at www.unglobalcompact.org. And, hope that these companies one day will understand that to endorse democracy and corporate responsibility is a prerequisite for “smart” growth. From now on, this issue is also on my political agenda. China's record on human rights is well known, and yet the US allows it's companies to do business there. Money certainly speaks louder than words. Strangely enough, the web took off very much as a publishing medium, in which people edited offline. Bizarely, they were prepared to edit the funny angle brackets of HTML source, and didn't demand a what you see is what you get editor. WWW was soon full of lots of interesting stuff, but not a space for communal design, for discource through communal authorship. The course material arrived today and below is a breakdown of what I received. This is only the first part of the supplied course material. The second part has a scehduled mailing date of 05.May.06 and is supposed to contain block books 4 - 6. The BBC has a streaming video of the penguins doing their exercise. Got home from work last night to find that the results for M206 had been published. After the exam I was expecting to get a Grade 2 and hoping for a Grade 1 (Distiniction), as we all agreed that the exam was bl**dy hard. Well I couldn't believe my eyes when I saw the result. I got a Distinction! And to top it all I didn't just scap it, I got 95%. 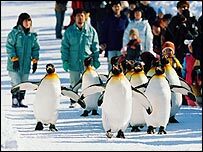 Penguins at a zoo in northern Japan have been taken on their first walk of the season in an attempt to keep them trim during the winter. Middle of December and the exam results for M206 have still not been released, even though the results for a number of other course have been. It is starting to get very stressful, this waiting!